Giggle Jungle is an indoor playground in Redmond, WA. Check out our review of Giggle Jungle below! 4 out of 5 elephants! Giggle Jungle is awesome on a rainy day! It’s a wonderful space for kids to play and explore when the weather doesn’t cooperate. Wish it was a bit bigger and stayed open a little longer. Note: I’m not compensated in any way for this review. This is simply the 100% unbiased opinion of a mom who’s tried the facilities. My tot is always demanding to go to the playground and when it’s too wet to play outside, we usually head for an indoor play space. One of our more frequented play spaces is Giggle Jungle, an indoor playground located at the Redmond Town Center. What’s there to do at Giggle Jungle? Like other indoor playgrounds, Giggle Jungle offers a safe and cushioned space for children to play at. There are no safety hazards like hard concrete, dangerous toys or slippery surfaces. 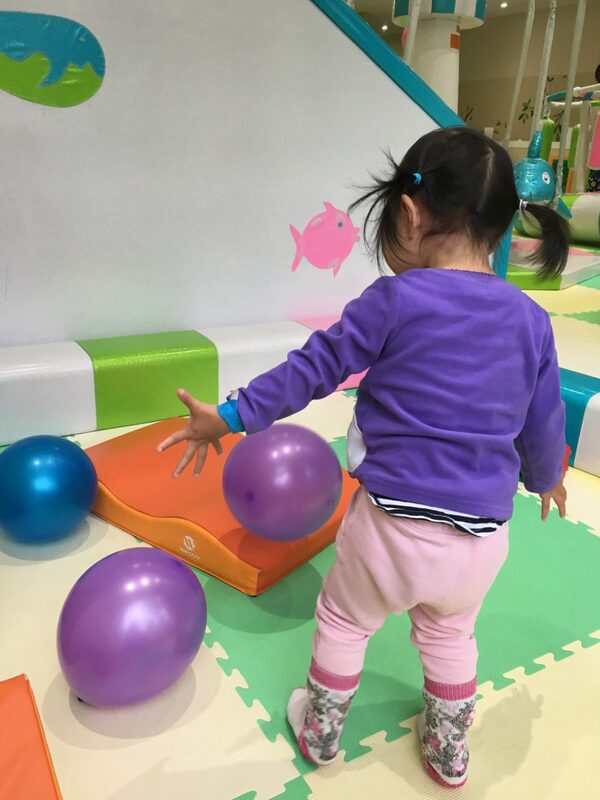 The playground surface is covered with soft foam mat and even young babies can play there safely. There’s a small area designated for infants and young toddlers to move about safely. There are also squishy foam blocks and toys for babies to explore. This is one of my kid’s favorite areas. It’s a small loft with ceiling fans that turn the room into a wind tunnel. With balloons. Kids absolutely love it there, although it took a while for my tot to work up the courage to go inside. Once she’s in there though, it was pretty difficult to persuade her to leave. 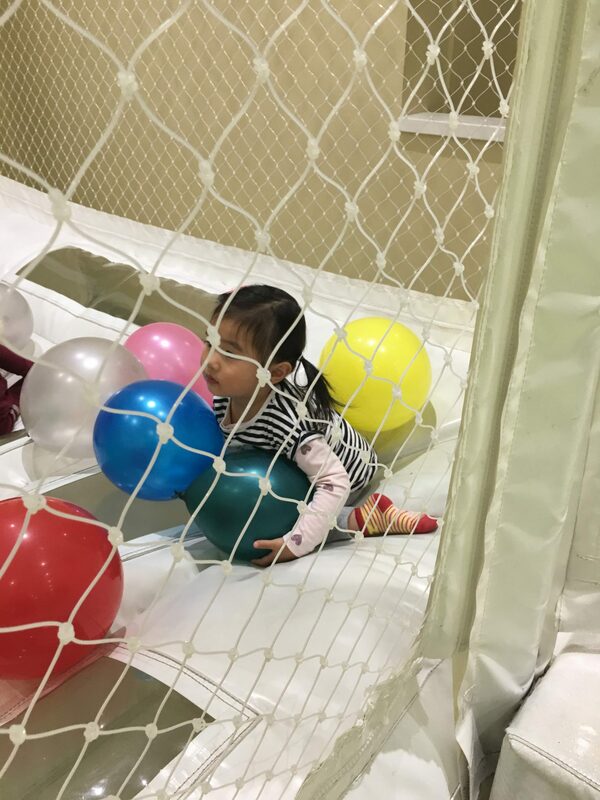 There’s a bouncy slide connected to the balloon room and kids can slide into a bouncy play area filled with more balloons. It’s fun there but do watch out for kids tumbling into each other as they slide down. This is another of my kid’s favorite. It’s a carousel with 3 squishy dolphins. It doesn’t sound like much but my tot loves it. If your kid is a climber, they’ll enjoy clambering up this cushioned wall. Parents will appreciate the soft squishy landing that’s also a bouncy trampoline. This is another carousel ride, but instead of dolphins, you get pogo sticks that your kid can jump on. 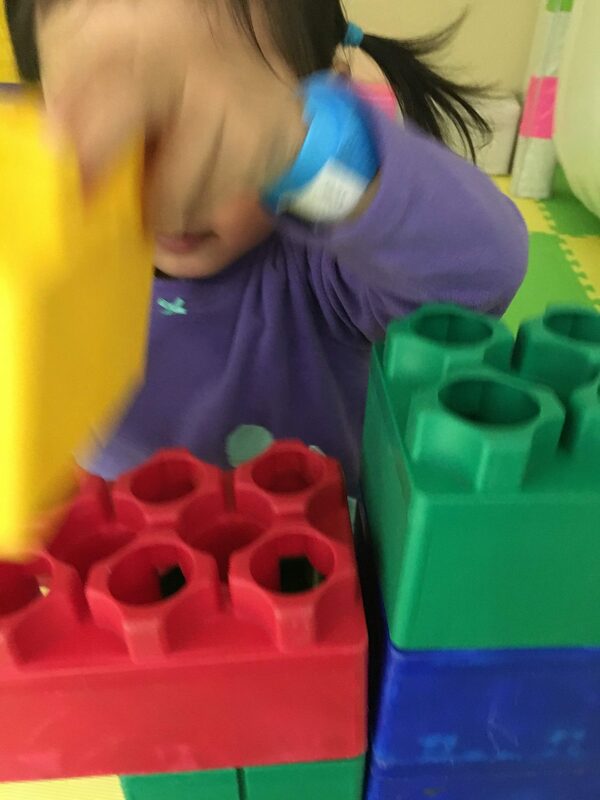 I didn’t think my kid would be interested in this at all, but she always spends at least 20 minutes playing with these giant Lego blocks. This is the only hard toy at the playground. Cleanliness was definitely something I was concerned with, considering how quickly cold and flu viruses spread indoors during the colder months. So far, my kid hasn’t gotten sick from the playground. Giggle Jungle provides hand sanitizers and I’ve seen the employee working there vacuum the play area regularly. The bathroom is sparkling clean as well. The admission fee is for all-day access, which means I can bring my kid home for lunch and nap, and bring her back for another play session in the afternoon. 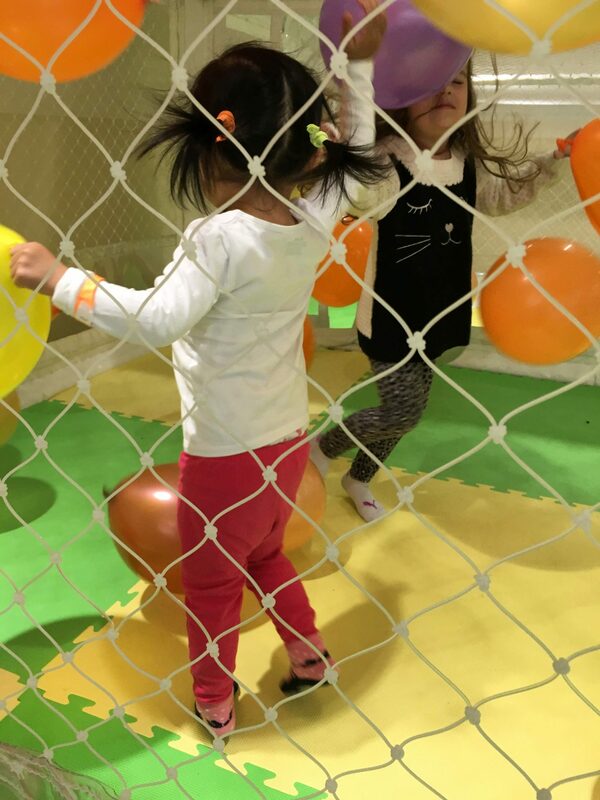 We’d visited Giggle Jungle on weekday mornings and afternoons, and during our time there, it was never overly crowded or hectic. Both you and your child need to wear socks to enter Giggle Jungle. You are not allowed to eat or drink in the play area itself. But towards the back, there is a designated eating area with child-sized chairs and tables. We often see kids refueling there before heading back to the playground to burn off more energy. There’s ample space near the cubby storage area for strollers. Check out discounted passes and punch cards on Groupon before you go. In November of 2017, the punch card ($45 for 5 visits, and $80 for 10 visits) offer better value than the daily all-day pass ($12). If you think your child would like to revisit the playground, getting a punch card offers better value. Would I visit the Giggle Jungle Again? Absolutely! Indoor playgrounds are helpful for surviving Redmond’s long and dreary winters. It’s a wonderful space for kids to play and explore when the weather doesn’t cooperate.